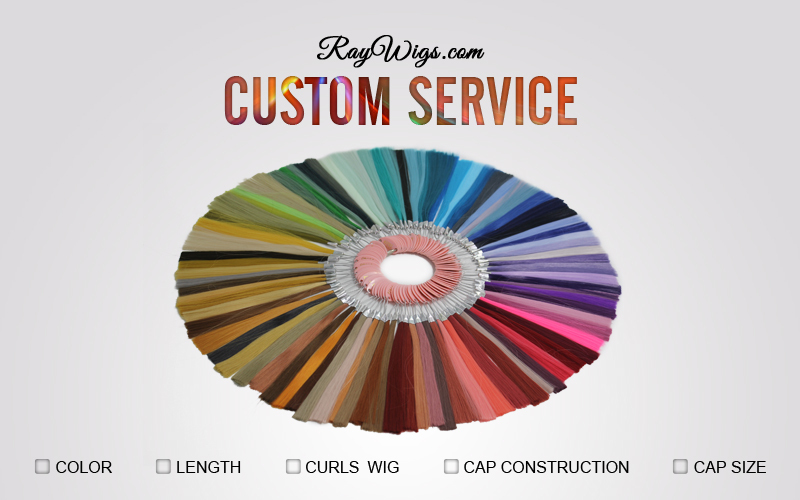 RayWigs can customize the wig just for you. You can customize your own hair color, your best fit cap size, and your own hairstyle. Color: All the colors included in our color ring can be customized, you can also provide us with the wig picture. For the multi-colored wig, an extra $20 will be needed for each added color. Length: As long as 30". If you want even longer, we will charge an extra $10 per inch. Hair Density: Our wigs normally come with 150% or 180% hair density, for thicker hair, we will charge an extra $30. Cap Size: We now offering average capsized wig, and an extra $10 will be charged for the customized cap. Cap Construction: We can make the wig with a full lace cap, lace front cap or mono top weft cap. An extra $100 will be charged for full lace cap, because full lace cap wigs are hand-tied by our talented workers, it's a very hard work. Curls: We normally do not charge for the curl patterns, but if with very small curls, an extra $20 will be needed. Click the custom wig page to offering us your ideas. And contact customerservice@raywigs.com for specific requirements.